The ideal system for arm immobilisation, protecting the sterile field with the added benefit of reducing scatter radiation. The ArmSure is particularly useful in the increasing number of procedures performed under conscious sedation where patient restlessness can be an issue. The ArmSure prevents the patient from compromising the sterile femoral access site while presenting the forearm for IV lines, anaesthesia, etc., throughout the procedure. The Shield slots into the Arm Support and can be simply adjusted to the optimum position for operator protection from scatter radiation. The 0.5mm lead (Pb) sheet encapsulated in the vertical shield reduces operator zone X-Ray scatter radiation. Testing was performed with C-arm head position at PA (0°). Results show dose with and without the Shield in place. View full test results here. The ArmSure system gently secures both arms of a supine patient in a comfortable adducted position with soft, easy to install, adjustable straps. 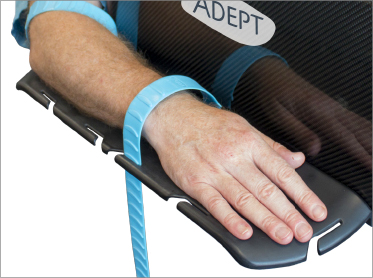 The unique design allows the straps to be loose while maintaining arm security and patient comfort.